Online reviews have always been a part of Google and good business management, but just recently Google has really started ramping up places you can features reviews. Based on some of these moves (discussed below), it seems that business reviews are going to be more important than ever in 2014. Small business owners need to make sure they’re taking advantage of all the different review options, making efforts to earn quality reviews, and communicating with the team about updating and managing comments. But how? Of course, there are many other places online that are less popular but still allow consumers to post reviews about your company. This includes forums, Yahoo and Bing platforms, and social networks like Facebook. It’s up to you to see where your audience is heading when they go to write a review. Consider setting up a Google Alert for your company name so you can monitor what is said about your company (at least to a certain extent). 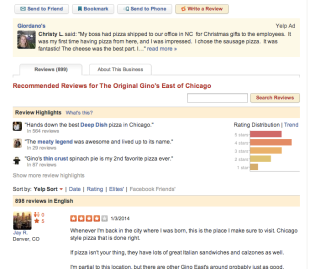 Ask loyal customers to leave a review before they go. Google and Yelp do not advise you, however, to offer any free gifts. Make it easy to leave a review either online or when someone is visiting your business by having a box for written reviews or a button on your website. If you see that someone left a negative review, try to reach out to that person, resolve the issue, and have them write another review. Put example reviews and testimonials on your website so people will want to participate. It’s important to remember that you do want a few negative reviews for your company (in fact, constructive criticism would be better than negative). This will help your company seem real and show that you are willing to face those negative reviews by commenting back. You can the Higher Visibility blog to learn more about reacting and recovering from bad reviews. How do you get caught posting a fake review? What’s the punishment if you get caught? If you get caught posting fake reviews, it’s very likely Google will penalize your site (making it harder to find on SERPs), and in extreme cases will completely block your site. More likely than not, however, you will get a fine. The amount will completely depend, but it can range anywhere from $1000 to $10000. How can you tell, as a consumer, if a review is fake? Look at the username and see if you can see any type of profile. A real author will surely use a real name and have a few social networks that all match up. If there is excessive praise or the opposite, it could also be fake, so pay attention to how the review is written. Is it constructive, or full of jargon? Do you think reviews will be more important in 2014? What are you doing to help foster some great reviews? Let us know your strategy and your thoughts in the comments below.